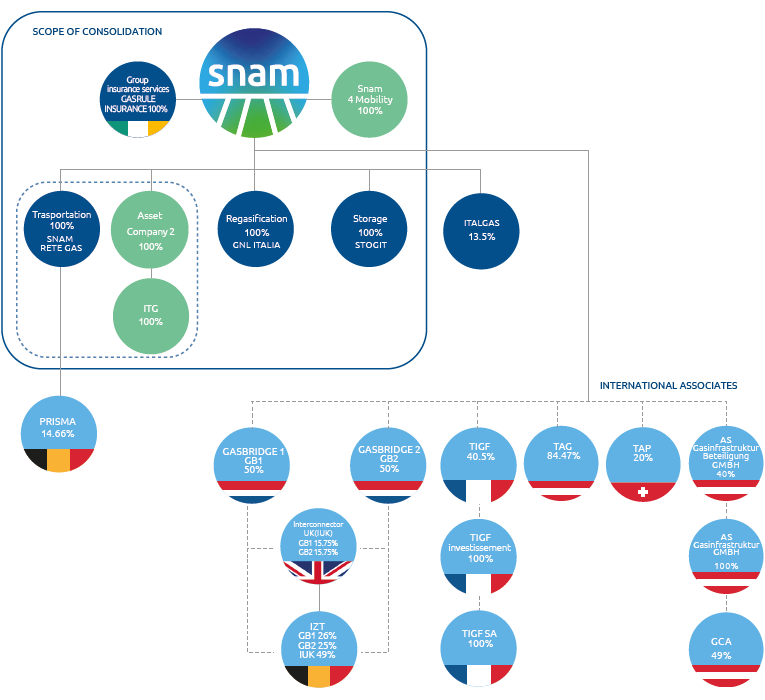 The main changes in the Snam group structure as at 31 December 2017, as compared with the Snam group structure in effect as at 31 December 2016, were the incorporation of: (i) Asset Company 2 S.r.l.2, 100% owned by Snam S.p.A.; (ii) Infrastrutture Trasporto Gas S.p.A. (hereinafter also ITG), 100% owned by Asset Company 2 S.r.l., based on the acquisition by Edison of 100% of the share capital of ITG, effective 13 October 20173.As the third Italian operator in the transport of natural gas, ITG manages the pipeline that connects the Adriatic LNG regasification terminal to the national transport network near Minerbio (BO); (iii) Snam 4 Mobility S.p.A. (formerly Asset Company 1 S.r.l.2), 100% owned by Snam S.p.A., and active in the construction and maintenance of CNG (Compressed Natural Gas) plants for motor vehicles throughout Italy, in the context of the company’s operating activity launch. The aforementioned companies were consolidated, respectively, under the “Transportation” (i and ii) and “Corporate and other activities” (iii) sectors. 1 The graph shows significant investments held by Snam. More information can be found in the Appendix “Snam S.p.A. subsidiaries, associates and equity investments at 31 December 2017” to the Notes to the consolidated financial statements. 2 Companies existing at 31 December 2016 and excluded from the scope of consolidation, even if 100% owned, due to their irrelevance as non-operational entities. 3 As part of the transaction, Snam S.p.A. acquired from Edison a 7.3% stake in the capital of Terminale GNL Adriatico S.r.l. (Adriatic LNG), a major offshore infrastructure for the discharge, storage and regasification of LNG in Italy.